Founded in 1996, Insight Therapeutics, LLC, is a Norfolk, Virginia-based “professional medical education, clinical research, and communications organization.” The ClotRx app represents Insight’s first and only app to date for the iPhone. As many clinicians well know, pulmonary embolus is sudden and terrifying event. It can strike the healthy and the ill, even celebrity athletes. Therefore, an understanding of clot prevention is important. Read more to find out how well Clot Rx app does. 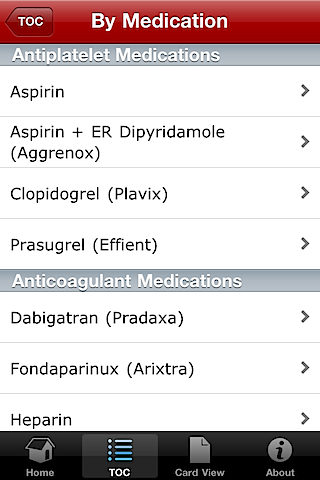 The app’s home screen features links to the Table of Contents, Card View, Disclaimers, and “About,” while the index bar at the bottom offers quick access to the home screen, the Table of Contents, Card View, and “About.” The Table of Contents offers browsing by medication or disease. Browsing by medication offers three categories—antiplatelet medications (aspirin, aggrenox, plavix, and prasugrel), anticoagulant medications (pradaxa, arixtra, heparin, LMWH, and warfarin), and mechanism of action (antiplatelet or anticoagulant medications). 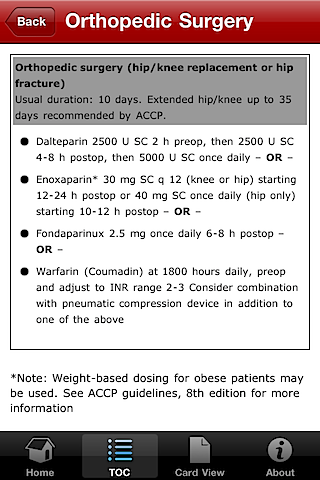 Clicking on a medication (here, plavix), offers links to dosing guidelines, adverse events, precautions/contraindications, and mechanism of action. 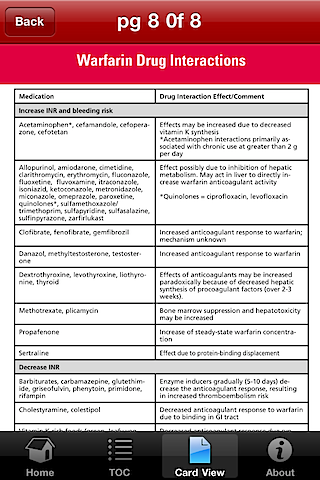 As seen here, these medication pages, while straightforward and concise, do not offer much in the way of additional information compared to our ubiquitous drug references such as MedScape or MicroMedex. 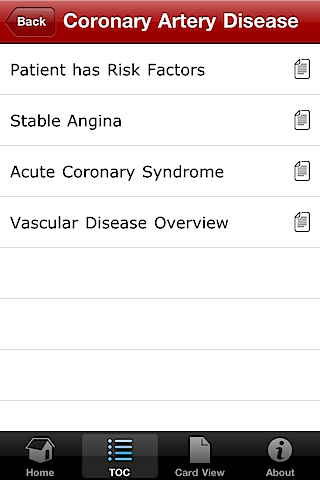 Alternatively, browsing by disease from the Table of Contents offers us a look at atrial fibrillation (a-fib), coronary artery disease (CAD), stroke or transient ischemic attack (TIA), peripheral arterial disease (PAD), and venous thromboembolism (deep venous thrombosis or pulmonary embolism (DVT or PE)). 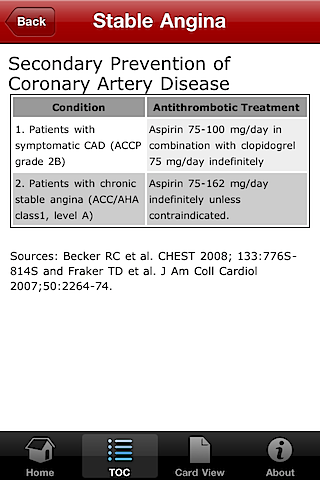 Here, we will look into CAD, which has its information divided into categories of risk factors, stable angina, acute coronary syndromes (ACS), and an overview of vascular disease. 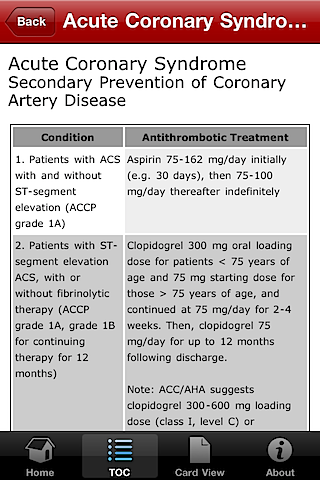 Clicking on stable angina displays a table with evidence-based (and cited) recommendations based on the ACCP and ACC/AHA guidelines covering the secondary prevention of CAD. 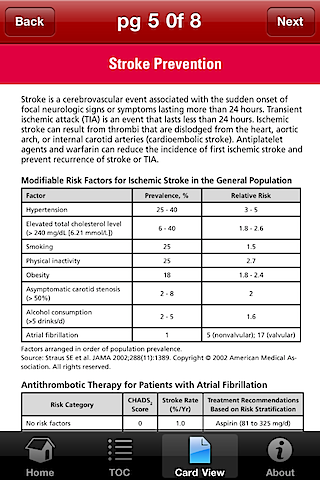 Similarly, exploring the ACS section displays its information in a similar easy-to-read table format with appropriate referencing as well as the strength of evidence supporting any recommendation. 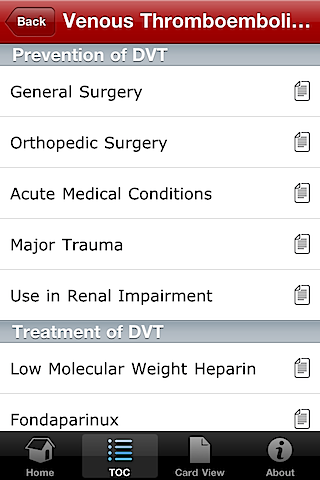 Of note, the VTE category does offer sections covering the prevention (and not just the treatment) of DVT—an important topic for many inpatients. 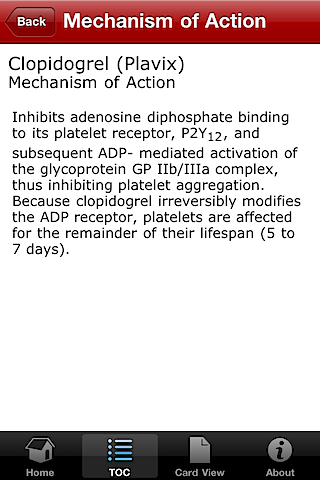 Finally, the Card View provides 8 “cards” with densely-packed but useful information related to antithrombotic therapy. These cards would be excellent as pocket cards to print and stick inside one’s white coat (or easily access on one’s iPhone!). 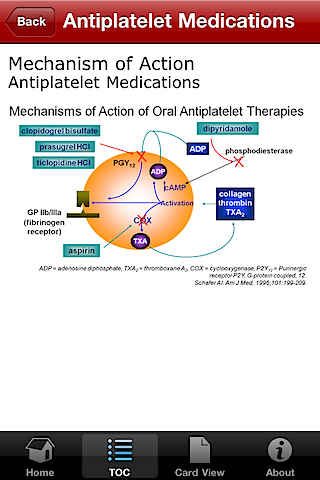 For example, topics covered include an overview of VTE, DVT and PE prophylaxis and anticoagulant reversal, treatment of VTE, stroke prevention, a warfarin overview, and warfarin drug interactions. The ClotRX app costs $1.99 on iTunes. This app does meet its stated goal of providing quick information on antithrombotic therapy. 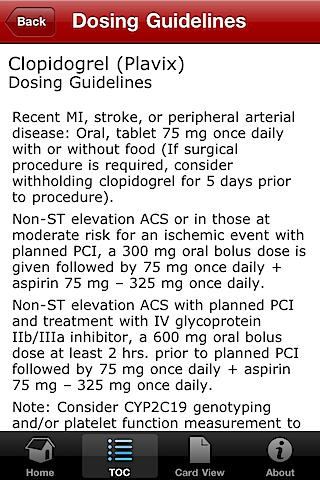 At my level (PGY-1), I found that I actually pulled out this app multiple times in a single day on my current rotation—inpatient general medicine at the Saint Louis VA Medical Center—to dose a heparin drip, double-check my decision to start a patient on warfarin for his new-onset atrial fibrillation, ensure I was giving a new admit the correct DVT prophylaxis, and make sure a stroke patient I inherited was on the correct regimen (and, perhaps most importantly, to learn about the strength of the evidence supporting each of these clinical decisions I was making). My use of this app will fade quickly, as I have quickly mastered most of the information in it, and the medication reference is no better (and much more limited) than the drug references most of us use regularly. 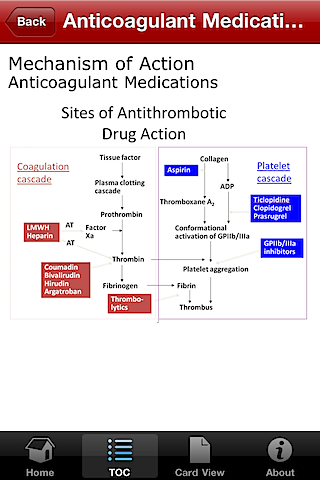 In summary, ClotRx offers a well-organized and evidence-based tutorial on the use of antithrombotic therapy that every medical student or intern would be well-served to master, especially given the importance of blood thinners in clinical practice. However, once the app’s content is grasped, it does not offer much value.